Wish there was a way to make minor adjustments to a socket without it delaminating? Tired of all the itching when grinding a carbon socket? Then check out Comfort Products' two innovative tubular stockinettes: SpectraCarb Stockinette and SpectraCarb/Aralon™ Stockinette. Both can be modified using a heat gun without delaminating. Available in five- and 25-yd. rolls. Easy workability, wets out well, and fatigue resistant. Dycor's DR feet are light-­weight and resilient because they rely on deflection of the varying-thickness leaf springs imbedded in the upper keel member, rather than compression of rubber bumpers. The DR feet are ground compliant because they incorporate uni, bi-, or tri-axial ankle articulation with low- or medium-profile options. Weight, including titanium pyramid and foot shell, is 312g (11 oz.). The New Balance 927 walking shoe is perfect for those needing comfort and stability. The 927 includes ROLLBAR®, a thermoplastic polyurethane post­ing system that minimizes rear-foot movement. The C-Cap® molded EVA midsole offers cushioning and flexibility, and ABZORB® SBS provides shock absorption in the heel. The removable ABZORB foam insole softens each step. The Walking Strike Path® rubber outsole guides the foot as the wearer walks. Features a full-grain leather upper. Men's 927 shoes are available in black lace and Velcro styling and white lace. Women's 927 shoes are available in white lace and Velcro styling and black lace. PDAC recently reviewed many OPTEC products, with the following decisions: VertaMax L-0627; Stealth PRO L-0631; Stealth Rehab L-0627; Stealth X L-0637; Stealth LSO LP L-0637; Stealth CB L-0637; Stealth Xtreme L-0637; Stealth TLSO with DLK L-0462; and Stealth TLSO with ATE L-0464. The Stealth LSO, Oasis LSO, and Oasis LSO LP continue to be L-0637. Now through October 29, 2010, you can experience the new Summit™ 637 LSO and receive 15% off all Summit 637 purchases through SPS. The Summit 637 delivers the same effective compression and motion restriction as the Summit 631, while providing extra coverage for patients in need. Rigid side panels provide additional lateral support while maximizing comfort. Effective compression and motion restriction. Ergonomic, comfortable fit to accommodate diverse anatomies and diagnoses. Four sizes accommodate 26- to 60-in. waist circumferences. 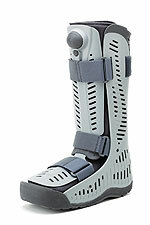 The newest addition to HOPE Orthopedic's industry-leading line of orthotics is the HOPE Walker. 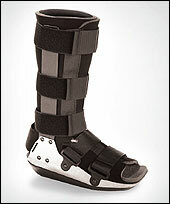 This computer-designed, rocker-bottom walking boot offers a pneumatic bladder to create a custom fit for most patients. The low heel height mimics a normal shoe for a balanced gait and is designed to reduce pressure on the knee and back. 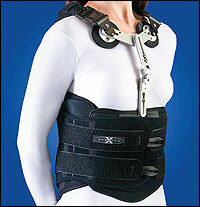 The malleable aluminum arms accommodate swelling and large dressings. The HOPE Walker provides an advanced design and superior quality at an affordable price. Easy to fit for practitioners and even easier for patients to use, this integrated, low-profile joint provides the best in electronic stance control and helps your patients enjoy a more active lifestyle. With the help of simple onboard programming, the E-MAG Active calibrates itself to capture the user's unique gait pattern. This unique feature adds a new dimension of functionality for people who previously had limited bracing options. Help your patients get back into the swing of things with the E-MAG Active. 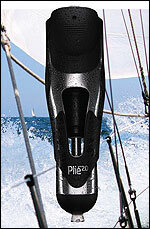 Plié 2.0 is the only MPC knee guaranteed to be water-resistant and protected from occasional contact with water. The resistance of the newly re­-designed Plié knee is controlled by pressure and position rather than speed. Swing-phase initiation is con­sistent across varied cadences and mimics biological norms. Plié 2.0 has a finely tuned control system that responds to ambulatory stimuli within 10 milliseconds-the fastest control-cycle time of any MPC knee. Requiring only 9.25 in. of clearance and weighing just 2.7 lb., Plié 2.0 is the lowest-profile and lightest-feeling MPC knee. The Element Foot System's™ 3rd Element technology produces an incredibly smooth rollover. Adding the DuraShock increases the vertical shock absorption and adds to the multiaxial rotation. The elastomers and carbon components work together to absorb, store, and return energy in vertical and horizontal planes. 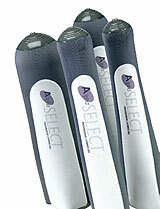 The result is a foot system that provides a high level of function and requires only 6.5 in. of clearance. 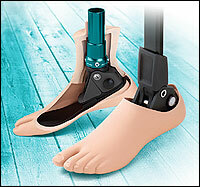 The Element DS Foot System is rated for patients up to 275 lb. 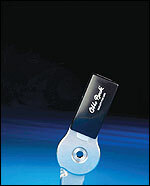 and has been tested to the highest standard-ISO 22675. New design, new materials, and new construction of the ALPHA Select Liner yields improved patient outcomes. Progressive gel measures 9mm distally and 6mm over the tibial crest, thinning to 2.5mm behind the knee and proximally. New accordion umbrella permits conformance to the wearer's own contours. Hybrid gel protects the limb from impact and resists excessive elongation. Abrasion-resistant select fabric panel easily flexes without pulling or tightening at the knee. One-way stretch fabric effectively controls pistoning without a distal matrix. For more than 20 years, Orthomerica® Products has been offering effective, non-operative and post-operative treatment solutions for lower-extremity fractures and range-of-motion restriction. Today, Orthomerica introduces the Orlando® KAFO/HKAFO Lower Extremity Fracture Bracing System. The Orlando is modular, lightweight, and can be ordered and stocked as components-making it immediately available or custom assembled to your measurements. Orthotists can choose from a wide selection of femoral and tibial components, hip joints, knee joints (free motion, drop lock, and adjustable range-of-motion), and shoe inserts to meet an individual patient's needs. With a fully integrated air pump and release valve, the Rebound™ Air Walker provides easy, tool-free inflation and deflation for fine-tuned, consistent compression. Its Flex Edge™ over-molding adapts and conforms to each patient's unique anatomy to help limit the formation of pressure points. Equipped with a rocker bottom engineered to promote a natural, stable gait, Ossur's Rebound Walker also boasts a trimmable, semi-soft toe bumper for protection against re-injury. Ventilated panels make it more breathable and improve patient comfort by wicking away moisture and helping to prevent microbial buildup. OPTEC's Stealth TLSO provides motion restriction for the thoracic vertebral and lumbar regions, with the ease of use and precise compression of our unique closure system. The Stealth TLSO is available in 3-panel and 4-panel versions, which include a dorsal lumbar kit (DLK) or a DLK with your choice of anterior thoracic attachment (ATE). PDAC recently determined that L-0462 and L-0464 are the appropriate HCPCS codes for the Stealth TLSO with DLK and the Stealth TLSO with ATE, respectively. Order the Stealth TLSO now through July 31, 2010, to receive 15% OFF the regular price. Orthofeet is introducing low-heel diabetic shoes that offer the "Slip-On" look with the comfort of adjustable-strap shoes. These unique Slip-On shoes feature a wide opening for easy on/off, along with a two-way strap system that enables fastening on either side of the shoe and easy adjustment of the strap length to perfectly fit swollen feet or feet with a high instep. Additional comfort features include a soft, protective lining with seamless design, and a lightweight cushioning sole with Ergonomic-Stride™ construction. Model 1013 is a posterior-offset adjustable knee joint that allows the orthotist to fine tune the A-P alignment of the knee; these features enhance knee stability and help broaden the clinical application. The A-P alignment and the extension/flexion angle can be changed by simply removing two screws; this allows easy adjustability without the need to physically alter the angle of the uprights. Model 1013 comes equipped with an optional bail-lock that can be engaged when the patient reaches full extension. The Alpha® AK Locking Liner with symmetrical gel style features hybrid gel which has a higher durometer that combines durability with comfort. The liner features 9mm distal gel thickness and 2.5mm anterior/posterior gel thickness. The symmetrical design of the gel allows the liner to be rotated for extended wear. The liner utilizes one-way stretch fabric for controlled pistoning without a rigid distal matrix and provides tissue compression without uncomfortable pressure on the limb. A flexible accordion umbrella blends with a patient's anatomyfor an almost unnoticeable feeling. With the Accent® foot, a simple push of the button provides 2-in. heel-height adjustment. Finally, a superior cosmetic finishing option in a service-free design to address individual footwear preferences. 2-in. (51mm) user-adjustable heel height. 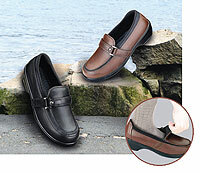 Sandal-toe foot shell with narrow- and wide-width options. Same-day custom-built and shipped to order. Accurate measurements giving you the slip? Try our new, double-column, digital height-dial gauge. It's good for set-ups and great for recording measurements after dynamic alignment. Digital dual-height counter that can be zero-set anywhere within range. Digital counter has two displays for upward and downward movement. Quick coarse readings with .100-in. graduations. Large, fine-adjusting feed wheel and lock. Isn't it time your practice measured up? You've been asking for it. Friddle's now offers custom On the Spot sublimation transfers with low minimum-order requirements. Call and ask about getting your company logo or custom On the Spot transfers. These transfers can be used on nylon or Dacron straps, or plastic. Double Your Foot Orthosis Production for 20% Less! The archXpress provides the most efficient, quickest pulls of any vacuum press. The genuine DuPont Corian™ deck is flatter and stiffer than other presses, which keeps your molds from breaking, saving you money. It's also more durable and cleans easily, saving you time. Oh, did we mention that it costs 20% LESS than other vacuum presses? 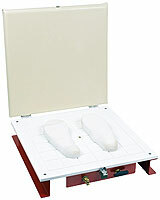 Priced at $699, you won't find a better deal on an orthotic vacuum press. Go to www.archXpress.com and order yours today! In celebration of 20 years as an O&P component manufacturer, Tamarack invites users of our Tamarack Flexure Joint® product line to register for a FREE Tamarack Hex Driver. 2.0mm or 2.5mm sizes available. Offer limited to one tool per facility, while supplies last. The ALPS Extreme Sleeve Fabric Reinforced (SFK) has superior comfort provided by ALPS GripGel™-which is more tactile than EZGel-to gently but firmly support the residual limb and sensitive tissues while preventing the sleeve from rolling down the patient's limb. The SFK has limited vertical stretch, but the elasticity of the fabric allows the user excellent freedom of knee flexion. Limited vertical stretch to reduce movement of redundant tissue. Seals to skin without reducing circulation. 6mm and 3mm uniform thicknesses available.